Click here for previous part of this trip. During the night it got windy again and we woke up every hour from when we went to bed till 0100. It was now 25 plus knots and very lumpy. The anchor alarm went off many times during the night as we twisted and turned. 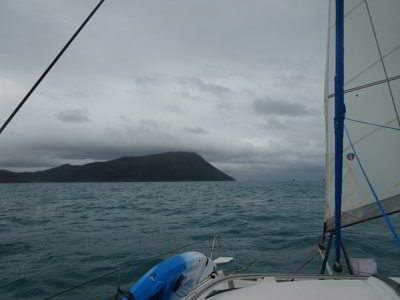 About 0515 the wind dropped to 12 knots but just before 0600 it went up to 25 plus again as a squall hit. It poured rain for 15 minutes and then drizzled for another 5 before stopping. The wind is back down to 15 knots by 0700. We get up at 0730. Norseman has already left, well not really as you will see later. It is cool at 20⁰C and overcast. We try to fix the screecher but the wind comes up a bit so we could not check if it worked. Tiara leaves for Middle Percy Island so Michael calls them on the radio to ask if they could let us know the conditions there. They later call and say it is a bit rolly but not too bad. We then go to the beach for a walk. We can not anchor in the small harbour as the tide is too high, but we can anchor the next beach around. 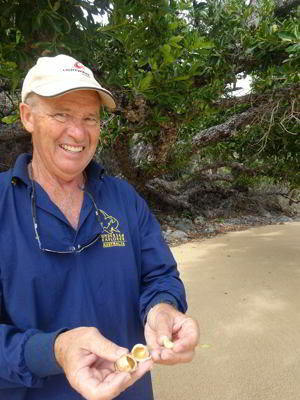 We discover a huge macadamia tree and there are many nuts on the sand. We open a few, a bit soggy but nice. We are back on Catlypso by 1000. We decide to go to Middle Percy Island. We leave at 1015 and sail over using the screecher. There is anywhere between 18 and 27 knots of wind, but the current is against us, sometimes as much as 2.5 knots. We are doing about 4 to 5 knots. We see that the other catamaran that we noticed this morning west of Tiara is also leaving. We are surprised to see it is Norseman who we thought left at about 0515 this morning. As we round the south-western point we pull in the screecher and motor to West Bay. We try to anchor between Tiara and a large power boat called Graeme V but we hang back at a funny angle, too close to the bigger boat. We move to between Tiara and Madiba and when anchored we are well back behind them. We are anchored by 1230 in 4.2 metres with the tide to go down another 1.2 metres. We have lunch. It is now sunny and warm, so we go to the beach. First thing we have to do is install our sign in the A-Frame building (the Percy Hilton). Michael had some large decals created with our logo and he stuck one on a piece of acrylic. He screws it into a spot. After this we walk up the track to the spot where you can get phone access as we need to check our emails and also get a decent weather forecast. We get access, it is not great today. Michael also phones his Mum. We walk back down and exchange some books at the book exchange. On the beach driving around (yes on the beach) is the tender from Graeme V. This can drive on the land. The owner is in a wheelchair so this gives him access to see things. 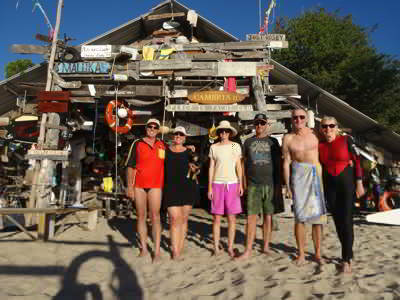 We go back to Catlypso after organising with all the yachties to meet back on the beach for sundowners at 1630. After doing some more work on the screecher, we head back to the Percy Hilton at 1630 for sundowners. All the yachts attend as well as some fishers. We have a good time, meeting lots of people. We are back on the boat by 1810. Michael then cooks some potato chips while Kelly cooks lamb loin chops on the barbecue (and some sausages for a later curry). After checking the weather today, we discuss what we are going to do and decide not to go to Scawfell Island tomorrow but stay here again. This is because it looks like we will have to stay at Scawfell till Monday due to weather, so we would prefer another day here. It was fairly calm overnight, but the wind came up to 15 to 17 knots at one time and at 0600 we started to roll a bit, probably because of the upcoming high tide. Tiara left for Scawfell and at 0720 we get up. We were going to move closer to the beach to take up their spot but Ilikai beats us to it. We have breakfast and then move closer to the rocks at the southern end of the beach when Graeme V leaves. At 0850 we take T2 into the lagoon and tie up near the boats. 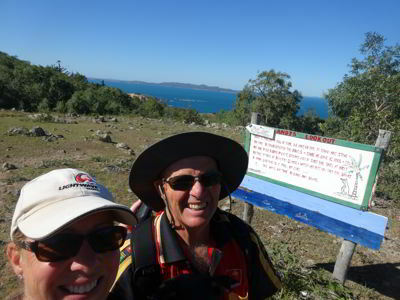 We then set off to walk to the homestead via the phone spot. It is four kilometres along the 4WD track. We meet Edward and Louisa from Madiba at the phone spot. 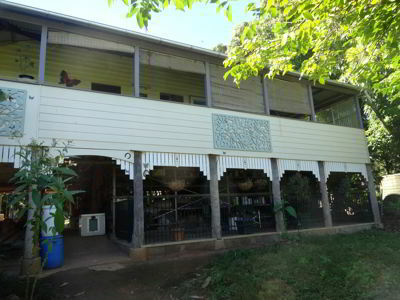 We then continue to the homestead. 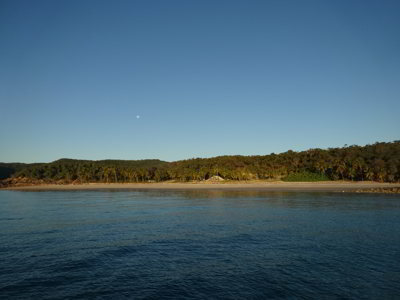 There is a great lookout towards South Percy Island along the way. It takes about an hour and 45 minutes to get to the homestead. Just as we pass through a paddock here, we see a stone curlew (a flightless bird) caught in the barbed wire fence. Its wing is hooked by one of the barbs. It takes us about five minutes to free it. Hopefully it will be okay. No one is at the homestead as they are unloading their supply boat back in the lagoon (it came in just as we were leaving Catlypso). We leave some apple strudel for them. We walk back via the shorter track, this is narrower and much steeper, but also much shorter at two kilometres. Along the way Veto runs off chasing a goat and it takes us a good five minutes to find her again. She is scolded by both of us. Very bad dog!!! It takes about 45 minutes to get back to the lagoon, although the section across the mangrove mud flats is a bit tricky. When we get back to West Bay it is obvious the conditions have changed dramatically. The boats are being hit by a south-westerly wind now and rolling badly. It takes some effort to get back on board. We have lunch and decide we have to stay here as it is too far to go anywhere now (apart from back to South Percy which would make tomorrow’s trip much longer). 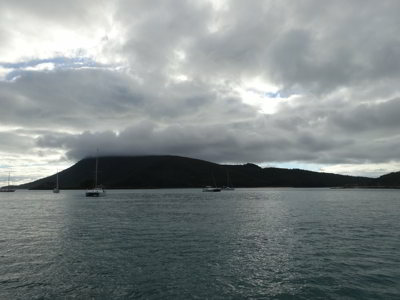 We decide to go ashore and hope that the weather forecast is correct and the winds will drop. We go back to the beach and sit in the A-Frame and read for the rest of the afternoon. We play two holes of sand golf (there is full set of clubs here), Michael wins. We then have a swim to cool down. Later Trevor, Judy, Richard and Susannah come back from their walk to the homestead. By now the wind has not only dropped, it has gone north-east. It is relatively calm. We go back to Catlypso and have sundowners. Michael makes fried rice and heats up some pies for dinner. We read, Michael updates this blog on his computer. About 2030 it gets a bit sloppy as the tide nears high. We go to bed at 2100 as we have an early start. What a horrible night!!! It got sloppy at 2030 and just got worse. We slept a little till at first but soon we were more awake than asleep. Michael thinks that he had perhaps two hours’ sleep from when he went to bed till about 0230. We decide at 0255 to get up and leave. There is not much wind here, but there are half metre waves coming in around the point and hitting us side on and we are rocking and rolling big time. We later decide that this was perhaps the third worst night we have had on Catlypso. By the way, the worst was also here, but the problem was north-west winds then. We motor out and soon have 22 to 26 knot southerly winds, this is what has been causing the wave action. Once out and aimed towards Scawfell Island, we pull out the genoa and motor sail at 5.0 to 6.2 knots into a 1 to 2 knot tidal current. We decide to not put up the screecher due to the strength of the winds and also because it is night. Michael is at the helm for the first 2.5 hours while Kelly is in bed with Veto (keeping her calm). Even though there is nearly a full moon, it is hard to judge the size of the following seas in the dark. At 0545 Kelly takes over and helms all the rest of the way to Scawfell (her choice). Michael then goes to bed with Veto and manages to get about half an hour’s sleep till he gets up at 0720 to check on Kelly. She saw some dolphins once it got light, we have not seen any for more than 10 days. It is a big, rolling sea, but the conditions really are more comfortable than last night at anchor. At 0615 a tug passes us heading south towing a huge barge of some sort. The wind goes down to 18 to 22 knots but then back up to 24 knots average. We have lots of 30 to 32 knot gusts and one of 35 knots! When he gets up, Michael puts on the watermaker. At 0805 Kelly logs on with VMR Mackay (only opens at 0800), but others have problems contacting them. Michael makes tea and coffee and toast for breakfast. 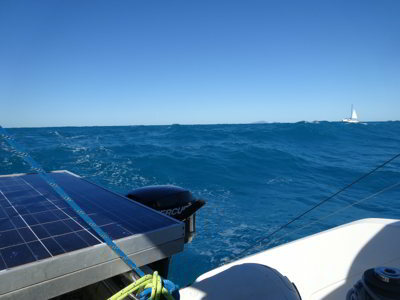 At 1145 we are doing 5.5 to 7.5 knots in 18 to 23 knots with a one knot current against us. Around this time Yrush overtakes us. 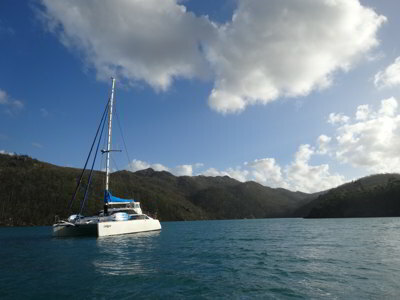 This small, 9 metre catamaran was anchored next to us last night and seems to have left soon after we did. It is a sunny day, but very cool at 20⁰C. 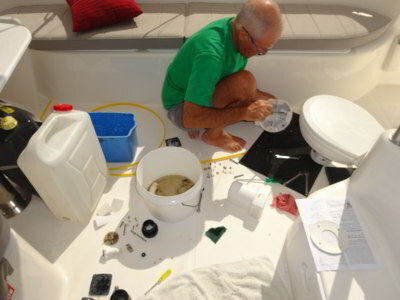 Michael turns off the watermaker after five hours, making about 115 litres of which 70 went into containers and the rest into the starboard tanks. We pull the genoa in as we approach the western point of Scawfell Island and then motor into the extremely calm waters of Refuge Bay. There are two parts to the bay, the southern bit and the eastern bit. In 2015 we anchored in the southern part. We go there first but a catamaran called Sol is in the best spot. 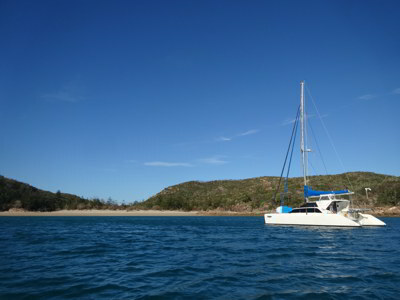 We go to the eastern part and decide to anchor out off the southern end of the beach about 80 metres from Yrush. It is 1430. Once we are sure we are anchored securely, we head into the beach. 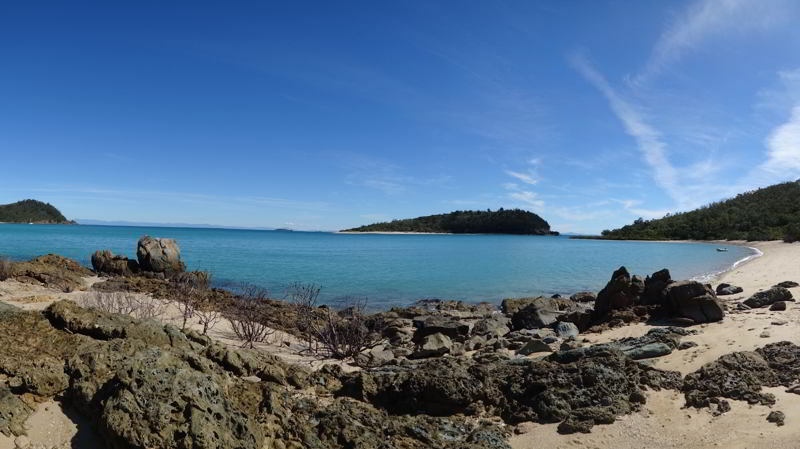 You can access this beach at any tide by sticking close to the southern end of the bay, the reefs are very obvious except when it is near dark. There are excellent national park camping facilities here, three tables, two covered by a roof and a toilet. However, it does not look like they get used much at all. When we get back, Kelly decides to have an early shower and Michael has afternoon tea. Later Michael goes to the beach again, and when he returns, he has a shower. We then have sundowners on the back deck. 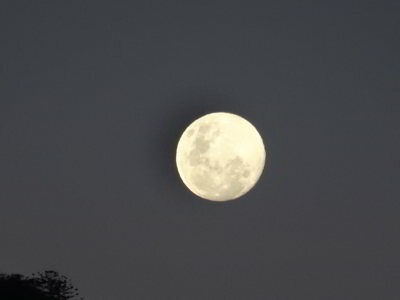 This is the most pleasant night we have had for about two weeks. Dinner is curried sausages and rice. We get some internet access by hauling the phones up the mast, but it is poor. We actually had good coverage just before we entered Refuge Bay. Michael writes up the blog and we are in bed and asleep soon after 2030. We have a very restful night, light winds till 0500 and the only rocking came at 0100 for about five minutes, perhaps a large ship passed by and sent its bow wave into the bay. We get up at 0800 and Michael goes ashore while Kelly prepares breakfast. After breakfast Kelly does some washing and Michael removes some screws in the cockpit rook and puts some Sikaflex in the holes before putting them back in again. We have been getting a few drops of water through one of the screws, so hopefully this will stop it. He then puts larger screws in one of the hinges for the port engine hatch as the old ones have worn loose. He also checks the oil and water for the engines. Kelly also checks the bows for water leaks, there is a tiny amount on one of the bolts but no pool under, so it seems our work from the other day has been successful. We then remove the nuts on the bolts holding the primary diesel filter for the starboard engine and put the washers back in place, we forgot to do this when we were on the hardstand at Lightwave. 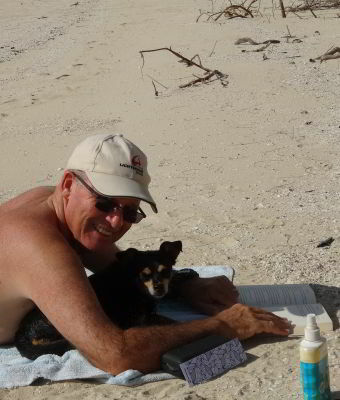 We then go to the beach and lay on the sand reading. We have a swim and read some more before returning to the boat at 1315 for lunch. There is now a large fishing trawler anchored behind us. At 1435 Halycon comes in and anchors almost beside us. Kelly also removes the masking tape from around the new Sikaflex on the cockpit roof joints. Werner and Liz invite us over for “afternoonsies”, so as soon as Kelly finishes what she was doing and Michael does a few things, we go over to Halycon (1530). We have a nice 90 minutes or so over there. While we are there, Trevor from Roma calls us and I answer from Halycon. We tell them there is plenty of room near us. After checking out the southern beach, they come over and anchor north-east of Halycon. When we leave Halycon, we go past Roma and speak about their trip over the past two days. They say they had a nice time at Digby Island last night. We then go to the beach and back to Catlypso. We take the washing off the safety lines, it is now all dry. The wind is under five knots now. Kelly puts on dinner, a flat chicken which we later have with salad. There are a few large turtles near us, we see them every few hours. Michael tries to get internet coverage, but no luck at all. When we get the phones back down from the mast, we do have new emails at least. We listen to the rugby league, Souths are playing Brisbane. Souths blow a few early tries and end up losing 24 to 18, they would have won if they got the early tries. We go to bed at 2200. Another very calm night, although there was a little rocking at 0330. We wake up at 0600 but do not get up till 0720. After going to the beach, we have breakfast and Michael makes a new batch of yoghurt. 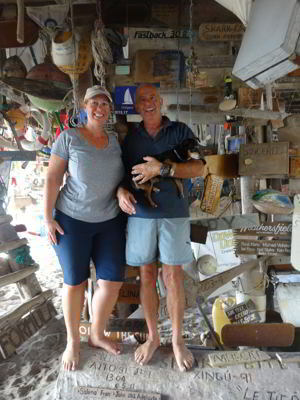 While we are finishing, Trevor and Judy drop by as they come back from the beach. They invite us to sundowners on the beach at 1630. We read till 1035 and then we go to the beach. We take a thermos of tea and some sandwiches for lunch. We lay on the beach like yesterday, a couple of walks and a swim. 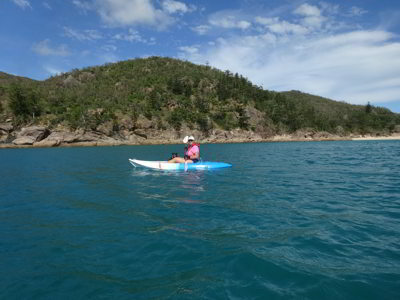 We speak to Liz who paddles into the beach. They are going to head to Brampton Island about lunch time. We go back to Catlypso at 1310 and laze around some more. A hard life! 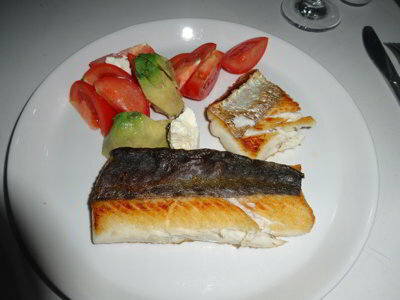 At 1630 Trevor and Judy come over and drop off a piece of mackeral for Kelly. Trevor caught this yesterday afternoon as they approached Scawfell. We all go to the beach, Michael running our handheld GPS so that we have a track back to the boat to follow once it starts getting dark. This is because the clear area between the reef in close to the beach is narrow and will be impossible to see once it is darker. We sit at the single table and have a nice evening of sundowners. Trevor tells us his batteries are now totally stuffed, so he will have to get new ones in Airlie Beach. Kelly has brought along the details of the ones we purchased last year for him. They are going to head off early tomorrow for Shaw Island. 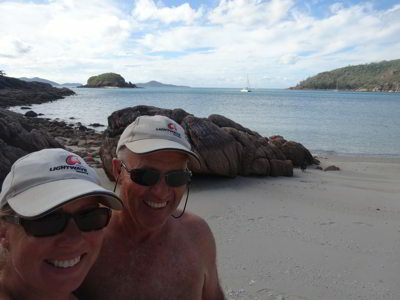 We will probably catch up again somewhere in the Whitsundays. We head back at 1745, with Thunderbird 2 in the lead. Michael has left over chicken and pasta for dinner and Kelly cooks the mackerel (Michael does not eat fish). She says it was great. We discover the toilet is not flushing. The macerator is working, but no water is coming in to flush. This happened back in September but it righted itself. We will try to work it out over the coming days and meanwhile, will use a bucket to flush. We go to bed at 2120. It was mostly calm overnight, although there some strong gusts at times. The anchor alarm went off many times as we twisted and turned in the changing winds. The seas remained flat all night. It rained at 0500 for a few minutes. We listen to the 0700 ABC Radio news and hear that Batman, Adam West, died. Michael really loved that TV show. Another great star gone! We have breakfast and at 0905 we pull up anchor and motor out of the bay. As soon as we are sure which way the wind is coming, we pull out the screecher. 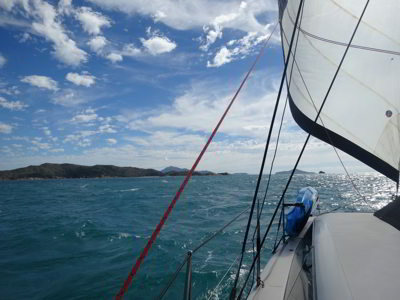 We have 15 to 20 knots of south-easterly wind and we are doing 5.5 to 7.0 knots. The wind later goes to 22 to 26 knots and we are doing 6 to 7 knots. The wind is from over our left shoulder and sometimes is a bit sloppy, but not too bad. At 1115 we get some protection from St Bees and Keswicks Islands and it calms a lot. We also get phone coverage in this area, the first good access we have had for two weeks. We phone our family as we sail across. 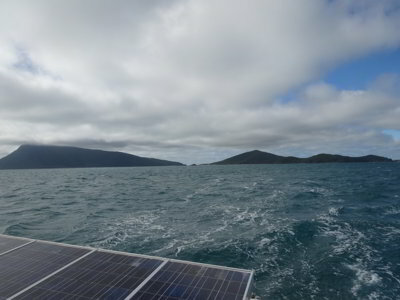 We pass the northern side of Carlisle Island and once the wind drops, we pull in the screecher and motor down the western side of the island towards Brampton Island. We anchor off the remains of the jetty at 1305. The jetty was basically intact in 2015, apart from the section where it joined the boulder section. 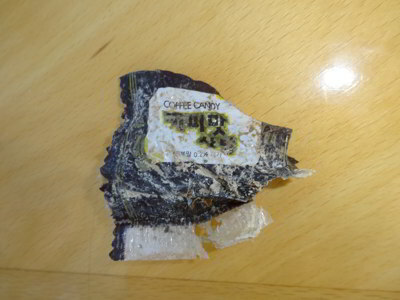 Looks like it has been removed rather than fallen apart. The weather by now is pretty awful, it is overcast and only 19.6⁰C and rain is falling on and off. Amica and Ilakai are here as well as another two cats. We have lunch. Now that we have internet access, Michael uploads photos to this web site as well as updating the text. It is raining mostly and a bit rocky at times. At 1540 the rain stops so we take Veto to the nearest bit of beach as the tide is too low to get to the derelict resort area. We are back by 1600 and have showers. At 1620 the rocking stops and the wind goes east and drops. We have sundowners and then chirozo pasta for dinner. After dinner we put the phones up the mast to get better internet access so we can update the Facebook page with photographs. We go to bed at 2100, it is calm. It was relatively calm overnight, but at 0300 there was some minor rolling for about 90 minutes and again at 0600 for a short time. At 0755 we tried to take Veto to the beach in front of the resort but there was a large dog there. Looks like there is still a caretaker at the resort. We instead go to the same rocky beach we did yesterday afternoon. The weather is much better today, with a lot of blue sky. We have breakfast and at 0935 we leave. Once again we motor out for a few minutes before pulling out the screecher. We have 18 to 20 knots at first but it later goes to 22 to 26 knots. We run downwind at 6 knots or so into a one knot tidal current. 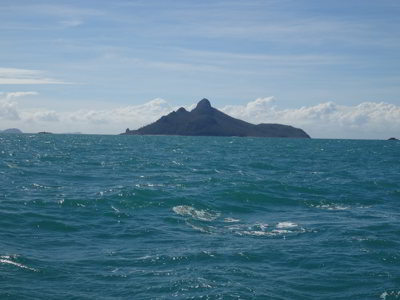 We pass to the west of Finger and Thumb Rocks and then between Linne and Goldsmith Islands (that is, to the east of Goldsmith Island). We sail around the top of Goldsmith and only pull the sail in when the wind drops to under 10 knots. 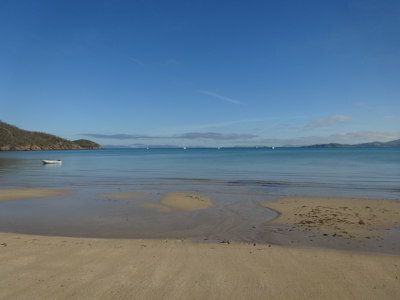 We motor the short distance into Roylen Bay (named after Roylen Cruises from the 1970s) and at 1155 we anchor in 4.5 metres off the middle of the beach. It is perfectly calm here, with wind of 10 to 20 knots from the shore. 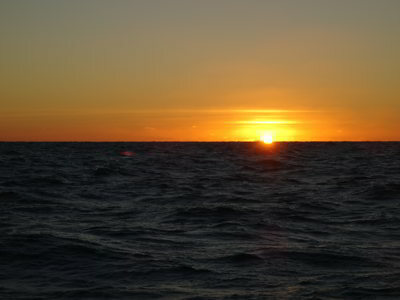 We have had an excellent sail in almost perfect conditions, small seas and good winds. There are another two boats here. We have lunch and then go to the beach. We walk the whole length of the beach and speak to Mark and Pat from Katmando who we have met before, at Bums Bay in 2015 we think. We are back on board at 1355 and we sit on the foredeck and read. 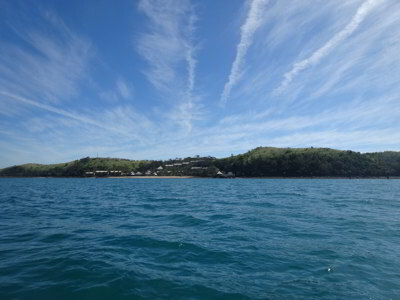 At 1545 we head off in Thunderbird 2 to go to the bay to the south of here, Minne Hall Bay, to have a look. Amica is here as well as another monohull. 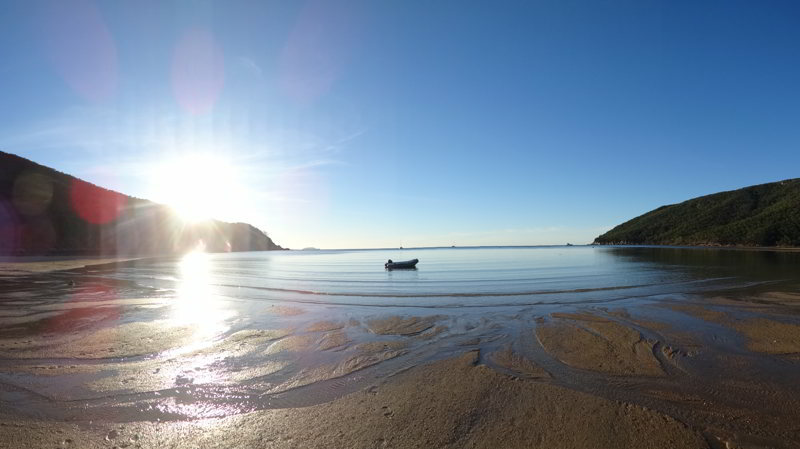 This is nowhere as nice as Roylen Bay, you are double the distance from the shore and it is much shallower in close. 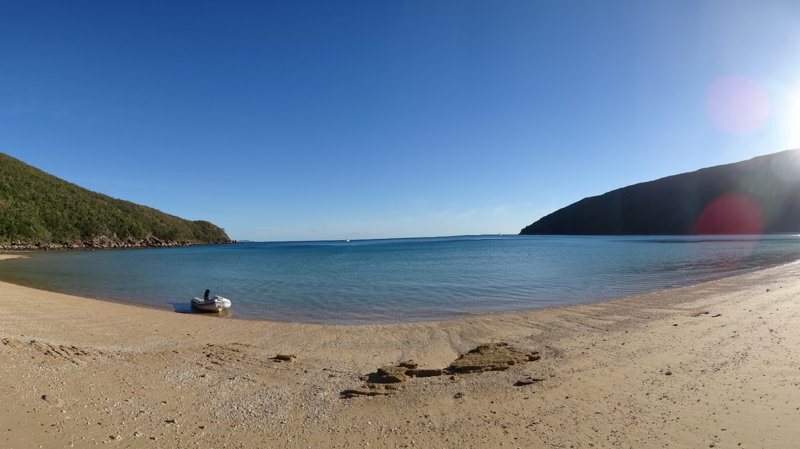 We have a quick look around and then head back to the main bay and beach. We have another walk there. We head back to Catlypso and have showers. We then have alcohol free sundowners on the back deck. Kelly cooks veal schnitzel and potato mash for dinner. Fantastic! We read, update blogs etc and then relax. We plan to stay here tomorrow as well. We go to bed at 2100. It was calm till about 0300 when a slight rolling started. This was not too uncomfortable, in fact, we went straight back to sleep. We woke at 0600 as the wind was now 17 to 22 knots. There was still only a slight roll. We get up at 0800 and had breakfast. It is a nice sunny day. Michael flushes the watermaker and also cleans the two filters. Kelly cleans the toilet and bathroom while Michael refuels Thunderbird 2. He also tops up the three small five litre petrol containers from the large 20 litre container. Kelly then cleans the stainless steel bits in the bathroom (taps etc). Michael then emails Halycon the manual for their HF radio which is the same as ours. Michael then does all the clothes washing, rinses it and hangs it out to dry. After this we go in T2 to Minne Hall Bay, the next bay to the south of us. We see Madiba come in and anchor at the southern end. 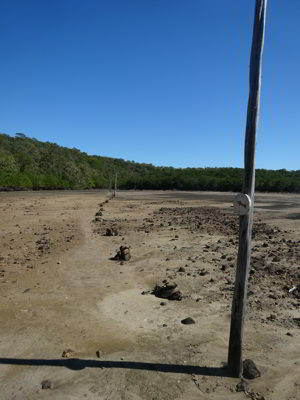 We go to the northern beach and try to walk to the next one, but the mangroves make it too difficult. We then go back to Roylen Bay. 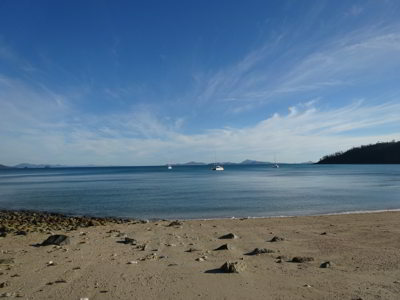 We set up on the beach, sunbake, swim and walk laps of the beach (six minutes for one length). We meet John and Trish from Apple Jack who came in a little while ago from Brampton Island where we saw them two days ago. We head back to Catlypso at 1305 and have lunch. We read for a while and then are entertained by a school of dolphins which are herding garfish towards each other and then leaping out of the water to catch the airborne garfish as they attempt to escape. Fantastic! At 1530 we go to the beach again for a swim and a relaxation. Michael also walks four more lengths of the beach, bringing it to 10 for the day. This is really a nice spot in weather like this (the wind is now under five knots). When we were here two years ago we had a pretty awful time, the weather was terrible and Veto got very sick. So much better this year. We are back on the boat by 1635. We have sundowners and then Kelly cooks chicken pesto pasta. There is a really great sunset, with the best colours a long way from where the sun actually set. We read after dinner and go to bed as usual at 2100. Another calm night, the only wind was when we awoke at 0600 and it was blowing 12 knots or so. We stay in bed and listen to the 0700 and 0745 ABC Radio news. We get up at 0800. Kelly makes breakfast, as most mornings, tea/coffee with muesli and homemade yoghurt and some mixed berries. We pull up the anchor at 0930 after a bit of work. There seems to have been some small bits of coral where we anchored and the chain was hooked around a couple of pieces. 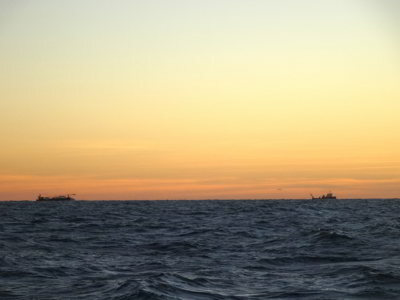 In fact, yesterday we realised that ahead of us was a largish bommie that we did not even see when we anchored. Luckily we did not have the chain wrapped around it. We head out north as we are planning to round Thomas Island on the eastern side. We pull out the screecher once we are sure which way the wind is coming from. However, it is only 10 to 12 knots, with occasional gusts to 15. We have a one or more knot current from the north, so we have to have one engine running to keep our speed over four knots. We sit on around 4.2 or so for most of the way. We pass to the east of Coppersmith Rock and Silversmith Island (yes, very interesting names for the islands and rocks near here) and then go between Dead Dog Island and Fairlight Rock. 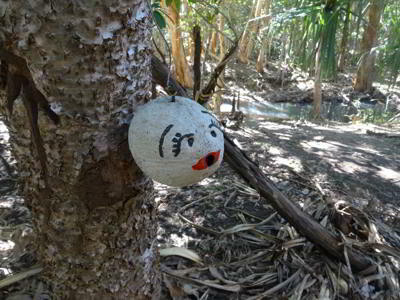 This brings us to the north side of Thomas Island. We head west and pass well clear of the shallow bommie off the northern end of the island before entering the sheltered western bay of the island. We motor in and anchor in 4.8 metres with 1.5 metres to go till low tide (perfectly planned as 3.3 was the minimum we saw). We are anchored just off Naked Lady Beach (it would be interesting to see how it got its name). It is nice and calm here, with winds of 10 to 12 knots. While Kelly makes lunch, Michael puts 66 litres of diesel into the fuel tank. 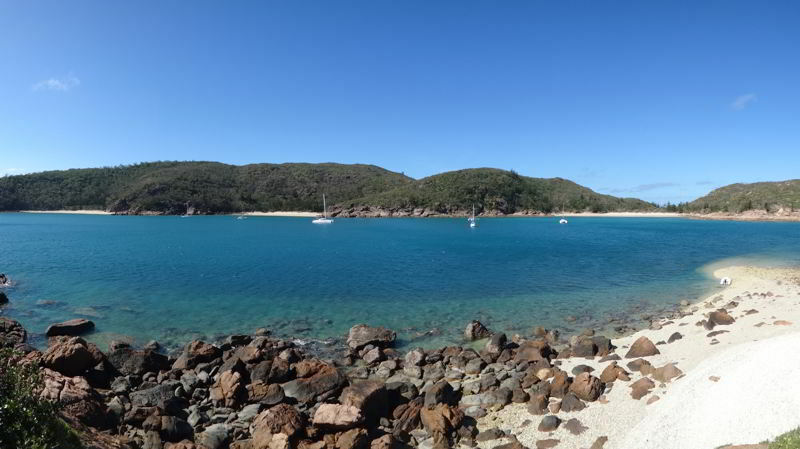 We have used 81 litres since leaving Great Keppel Island two and a half weeks ago. We have done 38.1 engine hours, meaning we have used 2.1 litres per hour. Once we are sure we are holding, we put our kayaks in the water. 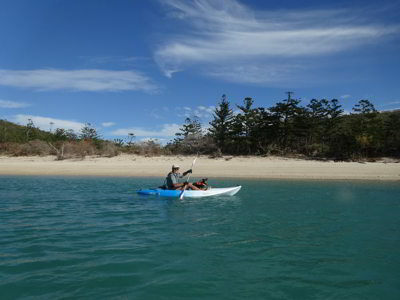 We paddle the kayaks over to the rocks to the east of us and then to the nearby beach. 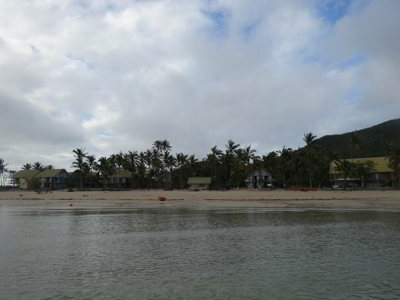 We have a look around and then paddle further north to the next beach. Again we have a look before heading south to Naked Lady Beach. This is the pick of the beaches, with the best sand. 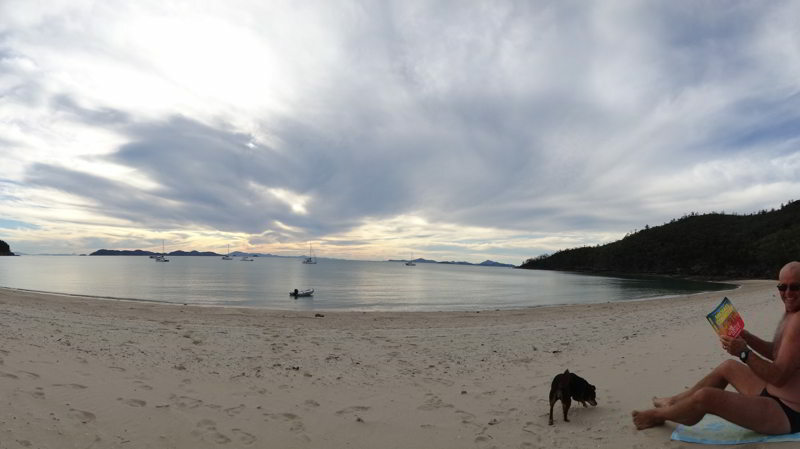 After a swim and a walk along the beach, we paddle back to Catlypso. By 1515 we have the kayaks back on board and secured. We have afternoon tea and then Michael makes up some spacers (using old garden hose) to replace lost ones between the HF radio aerial cable and the stay. He puts two cable ties on each one to ensure these are not lost. At 1630 we go to the beach again for a short time and then come back. We have showers, sundowners and Kelly cooks a stuffed roast pork roll with vegies. A really, really nice dinner. It is still calm and the wind has dropped to under 8 knots. We read, update the blog and go to bed at 2100. If the conditions tomorrow are okay, we may stay here another night. It was very calm again last night, but at 0500 the wind picked up a bit and by 0800 the wind was 12 gusting to 22 knots. Michael takes Veto to the beach and then we have breakfast. It is a nice sunny day, but cool due to the wind. Four yachts come into the anchorage before 1000, including Madiba. A Seawind 1160 (Avalon Spirit) comes in and we notice he only has one engine running and has a rope over the side near his starboard stern. We soon realise that he has a rope from the bow to the stern in the water. Michael goes over and speaks to Chris to see if he needs help. He says that when he went to pull down his spinnaker, the sheet to one corner came free and went into the water and wrapped around his prop. He says he thinks he will be okay and Michael tells him to call us if he need assistance. Within 10 minutes he appears to have it free (turns out that his folding props meant the sheet fell off and when he was in the water he was able to remove it easily). We go over to Young Toms Island which is the small island in the anchorage. This has a huge pile of old coral on the “beach” and you can climb up the island a bit (probably to the top if you wanted to). It gives great views of the anchorage. We then motor around to the beach to the west of us. The wind is now more like 20 knots so it is a bit rougher. We go on the beach, this is really nice with the best sand of the four beaches on this side of the island. There are also a few small pieces of boat wreckage here, possibly from Cyclone Debbie which hit in early April. We then head back to Catlypso. We decide to have another look at the toilet. This time we decide to look at the inlet hose. This is because back in September 2016 when coming up to the Gold Coast from Sydney the toilet would not flush for a day or two and then worked. We think there may be some blockage. We disconnect the hose from the thru-hull and Michael uses a plastic sparkies cable feeder to shove up the hose. Sure enough, it strikes something well before it gets to the pump. He pushes and pulls it and soon a lot of gunk comes out. Looks like there are some shells in there. More work brings out a pile of sand and more shell. This is definitely at least part of the problem. There is no strainer/filter on this hose, so anything can get sucked in. We spend a lot of time cleaning the hose (we cannot easily get to the other end to take it right off). Certainly the water flow is now a lot better, but still not as it should be. We fill the hose with some acid and let it sit a while before pumping again. A bit better. We have a lunch break and return to it afterwards. 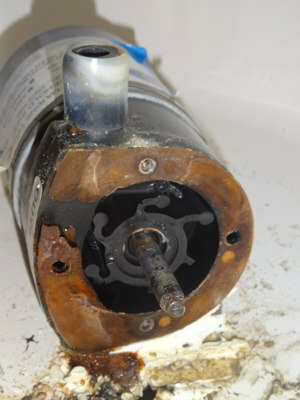 We decide that tomorrow we will pull the pump apart and look at the impeller, it may have been damaged by the shells. is connect to the clear hose we have running up high. 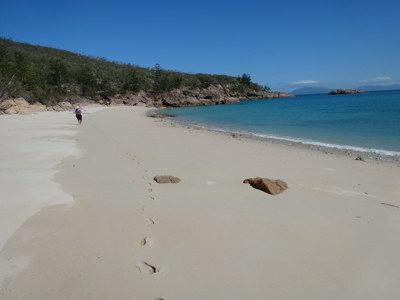 We decide to go to Naked Lady Beach to swim, walk, sunbake and read. The wind has by now dropped back to about 12 knots. We spend about 90 minutes here. Russell and Carolyn from Rhythm come to the beach and invite us to sundowners at 1600. 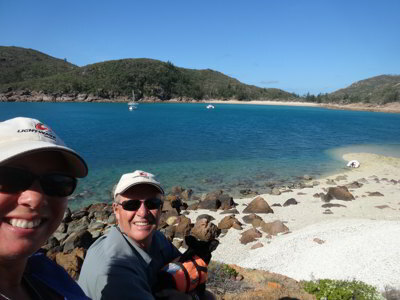 We first met them at Great Keppel Island and have seen them in The Narrows and Island Head Creek. We are back on Catlypso by 1530 and at 1600 we go to Rhythm. Veto is not happy to be left behind. Also there are Martin and Judy from (? ), Chris from Avalon Spirit and Sherman and Judy from Fair Winds. We have a nice 90 minutes on Rhythm. As sunset falls, we come back and later Michael cooks rump steak on the barbecue for dinner. The wind has now gone back up again to 15 to 17 knots with some higher gusts. We read, listen to the radio (great to have radio again the past few days) and relax. We go to bed at 2100. A very calm night was only interrupted by a few gusts of 20 knot winds here and then. It was an almost perfect night comfort wise. There was a little rain at 0500 and it is still a bit cloudy when we get up at 0800. After a walk along the beach, Michael does a few things at the bow. 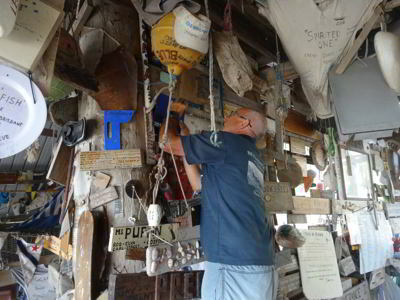 He readjusts the screecher furler (turning it back to the correct position). He then attaches some cable ties to D-shackles to stop them undoing. We have breakfast and watch as Ilakai comes in and anchors next to us. After breakfast, we prepare to leave. We up anchor at 0920 and motor out of the anchorage. As soon as we are clear of the shallow water, we pull out the screecher and are doing 5.8 to 6.5 knots in 20 to 22 knots of south-easterly wind. The seas are not too bad, but there is a slight chop on our port beam which sometimes shakes us a bit. 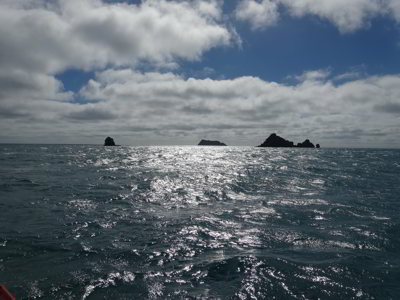 We pull in the screecher as we round Platypus Rock which is off the south-western point of Shaw Island (and interesting thing is in late August 2018 a large power boat ran straight up on Platypus Rock - it has a west cardinal mark to show where to keep clear of!). We then motor the short distance north to Burning Point and then east into the anchorage. We end up anchoring near where we did in 2015. 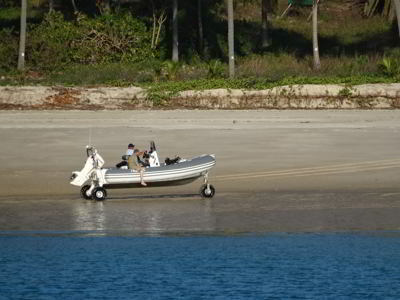 You have to anchor a long way from the beach as it is very, very shallow for a great distance off the beach. We anchor in 2.5 metres at low tide with the tide to drop a further 0.5 metres over the coming days. Madiba left Thomas just before we did and is anchored in front of us. We have lunch and at 1300 go to the beach to swim, walk, sunbake and read. On the way we drop off some shells for Imogen, she is collecting them. While on the beach we speak to the couple off Aquavista. It is very hot on the beach, and after a few swims, we decide to head back at 1500. Once back, Kelly has a shower and Michael puts the generator on so we can use the rice maker. We need some for tonight and tomorrow’s dinner. At 1630 Michael goes to the beach to the west of the main one. When he comes back, he has a shower, you really do not realise how good it is to have one after a few days without such a luxury. He then makes fried rice for dinner tonight and Kelly puts pork ribs in the oven. We have sundowners and then dinner. We later listen to Souths play the Gold Coast Titans, but at first we suspected this would be the last time we would bother as again they were playing very poorly (we have not TV coverage and the internet is too poor to watch on the phone app). However, after being down 14-0 they come back and win 36-20. We go to bed at 2200. It was a very calm night and when we get up at 0800 it is sunny and there is very little wind. Michael goes to the beach and we then have breakfast. 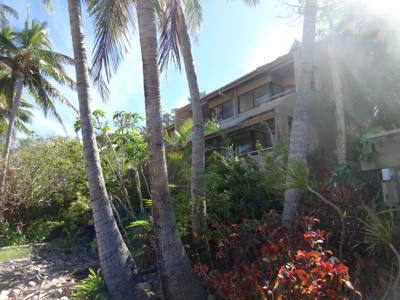 We decided last night to move closer to the beach and more to the east of our current location. We up anchor and move about 200 metres. More boats come in, Rhythm, Ilakai and others. At 0930 (or may be even a little earlier) we start work on fixing the toilet. We suspect this could be a big job (sorry for the bad pun) and know it will be a crap job (again, sorry). 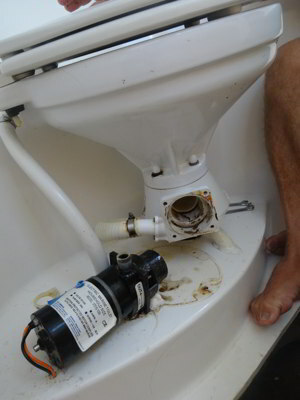 We have a service kit for the toilet which has a new impeller and some other parts. To access the impeller, we have to first remove the toilet bowl from where it is mounted and then separate it from the macerator and pump part. This also is difficult as there is a lot of silicon on parts (some put there by us to stop some leaks). 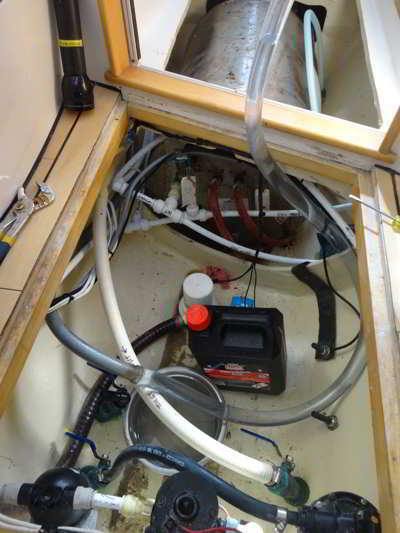 The inlet hose for the salt water is also inaccessible until we pull the whole structure up. 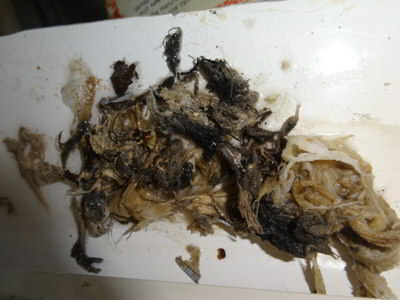 We eventually separate the bowl section from the macerator and discover that there is a pile of rubbish in there, a plastic lolly wrapper and lots of what appears to be cotton fibres. There is also a lot of what we assume is calcification. We have to use small screwdrivers to chip this all away so we can remove the nut off the macerator which then lets you access all the other parts. The instructions and diagram with the service kit is very poor and neither tells you the size of the nuts, the direction they turn to come off (it is anti-clockwise - opposite of the way the macerator spins) or that the centrifugal pump is held in place by a small hex grub screw. In fact, the design of the whole thing is not made for easy maintenance. When we finally get into the impeller housing, it becomes apparent why we have had a problem. Two blades are missing and two more a partially broken. No wonder it was not working. By 1130 we have it all apart and the pieces in a bucket with vinegar trying to clean it all up. We have morning tea and then get back into reassembling it. While Michael puts the toilet bowl section back together, Kelly cleans up where it is mounted. It is hard work as we have to lie on the shower floor to access most of it. We then start putting it all back together. This takes time, but we work it all out and have it back together apart from when Michael drops a seal and it disappears into the bilge and ends up under the hot water heater. It takes us probably 30 minutes to find it! Another problem is that the new O-ring between the impeller housing and the toilet is very soft and does not stay in the indentation. No matter what we do, it falls out. We cannot put it together with the O-ring sitting in its place and dropping the toilet on it as we do not have space to put it all together like that. Finally we think we have it right. We put it all back together and then test. Bugger, water squirts out of the macerator housing. We have to remove the toilet again (should have tested before screwing it in - the bolts are very hard to access, again, a poor design). We decide to put the old O-ring in as it is flat and much stiffer. We connect it all back up and test. No leaks! 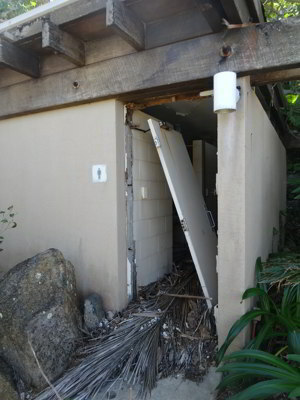 We bolt the toilet in (only two bolts as one was broken when we removed it) and test again. It works!!! It is now 1530, we have worked right through lunch and afternoon tea. 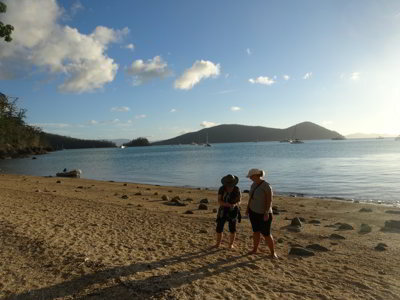 Earlier we were invited over to Ilakai for sundowners, so after a quick run to the beach, we head over. As well as Richard and Susannah, there are Martin, Judy, Chris, Russell and Carolyn. We have a nice evening, regaling them with the story of our crap day! We are back by 1730. Kelly makes tomato pasta and we listen to Triple J till we go to bed at 2100, exhausted and sore. Last night was even calmer than the night before. We wake at 0620 and listen to the 0700 and 0745 ABC Radio news. After a trip to the beach, we have bacon sandwiches for breakfast, a treat after yesterday's rotten day. 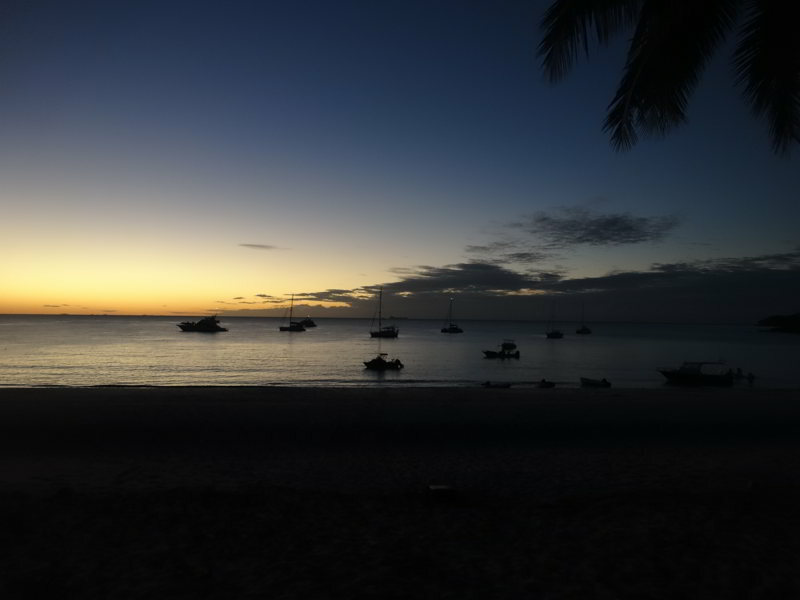 Five yachts leave quite early, including all the ones we were with last night at sundowners. It is sunny with less than five knots of wind. While Michael does a little bit of clothes washing, Kelly makes the other cabin's bed as we have guests from tomorrow. She also does some cleaning while Michael does some final finishes to the toilet repairs and cleans the water out of the bilge that got there yesterday when the first attempt at running the toilet leaked. Michael also uses the hacksaw to remove a cheap GoPro type camera housing from the rear steps and then contacts our neighbour back home to get a couple of bolts for the toilet. These will be brought up by Ron and Donna when they come up in a few weeks. We decide to go for a run in Thunderbird 2. 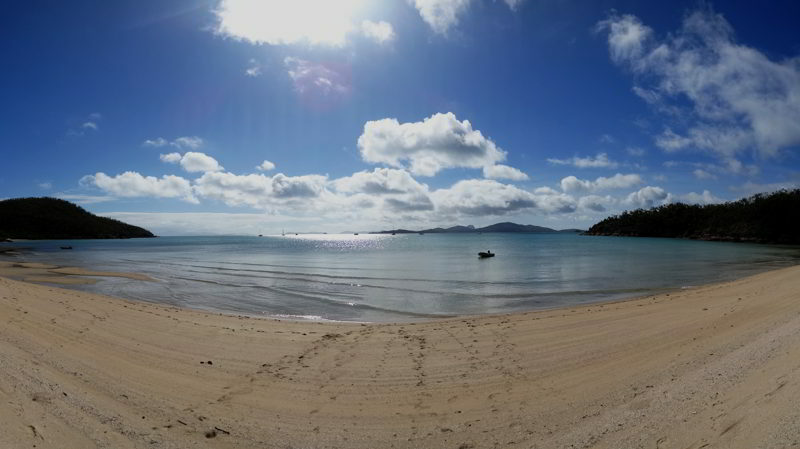 We first attempt to go to the beaches to the east of us but it is too shallow (low tide is soon) and there are lots of small coral bommies, so we head for Lindeman Island. This is about 2.7 miles from us. We have a good run and it takes about 15 minutes to get there. 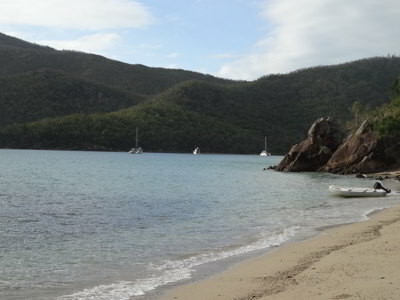 Lindeman Island Resort used to be one of the premier tourist destinations in Australia. 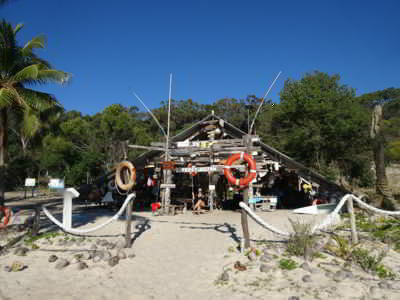 It was sold to Club Med who closed it in April 2012 and on-sold then to Chinese interests. They have done nothing to reopen it. 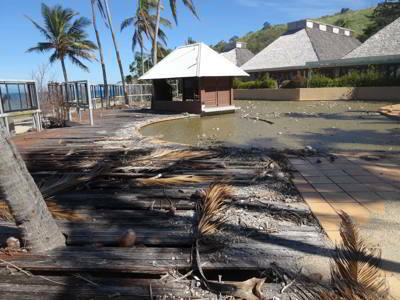 We anchor off the boat ramp and walk into the derelict resort. It is very sad to see the neglected resort, paint pealing off window frames, windows smashed, roofs blown back by recent cyclones and doors smashed in by winds or seas. The swimming pool is covered in algae and pumice. It is disgusting. Veto thought it was land and went right in, disappearing under. Luckily she still had on her lifejacket and she came back up and Michael plucked her from the water. We check out the reception area and what was probably the bar and restaurant areas. Some of the doors and windows are blown in and there is aluminium sheeting blocking it up. We walk back past the water sports building and then to the wharf. This looks in reasonable condition, only the steps are covered in oysters. There are still a couple of tide times posted on the wharf buildings! 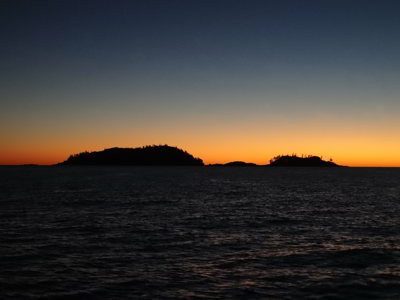 We head back out and go to Seaforth Island which is to the south of Lindeman. We were going to land and have a swim, but the wind has picked up so we head back to Catlypso. It is blowing 15 knots so we have a rough trip back. Kelly washes Veto to remove any traces of the pool water! The timber around the pool is falling apart and the pool filthy. This is where Veto fell in! Are these sea whip skeleton parts? At 1415 we run the port engine for 45 minutes to heat water for a hot shower. At 1500 we go to the beach and read and walk till 1630. 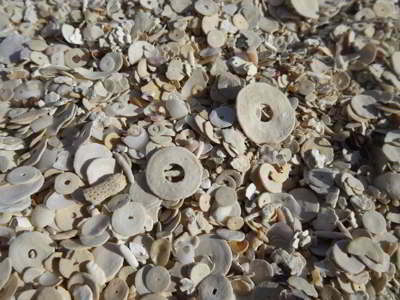 We collect some more of the round "shells". We have since been told that these are sea whip skeleton pieces, but we are not sure. See above photograph. We have showers, then sundowners and a nice massaman beef curry and rice. Michael writes up the past few days blog. The wind has been blowing up to 20 knots since 1800 but at 2015 it dies right back down. We go to bed at 2100. It was calm again last night, but the wind increased closer to dawn to 17 to 20 knots. We sleep till 0700 and get up at 0800. After a run to the beach and breakfast, Michael washes our bath towels and hangs them out. Kelly does some cleaning as our guests are arriving today. We pull up the anchor at 1020 and sail in a wind of 20 to 22 knots at 5.4 to 6.0 knots with no tidal influence. It is sunny and soon after the wind drops to 15 to 18 knots and our speed goes down a little. We are not in any rush, so we continue at this speed. Michael takes some video of Dent Island as we approach as a friend has asked for some video for a documentary he is making about the SS Yongala. Not the best as it turns out as the boat is bouncing around too much. At 1205 we pull in the screecher and motor the rest of the way to Hamilton Island. 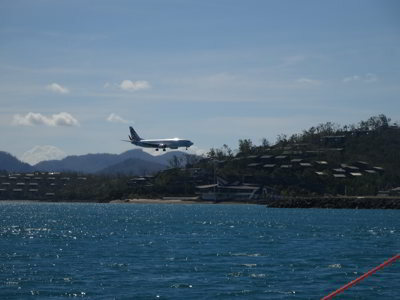 As we near the runway, the Virgin Australia 737 comes in to land. This has on board Kelly’s former boss, Rosemary and her husband Graham. Kelly radios the marina and soon they come out and lead us into our temporary berth. We are only staying one hour, just enough time to drop off rubbish, fill up with water, do some food shopping and pick up Rosemary and Graham. The cost is $20 for the hour ($18 in 2015). We are put on a spot at the end of a leg, so it was very easy to tie up. Kelly pays and then heads off to the shops. Rosemary and Graham arrive and board. Michael fills up the water and washes some of the windows. Kelly comes back with the food and some pies for lunch, a very nice change. We are here 75 minutes but the marina says nothing. 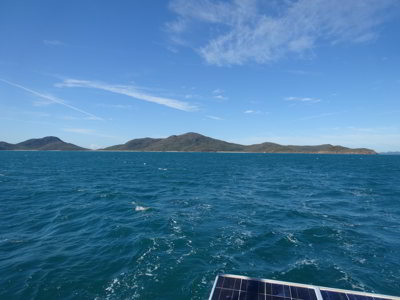 We motor out between Dent and Henning Islands and then using the screecher, motorsail towards Cid Harbour. 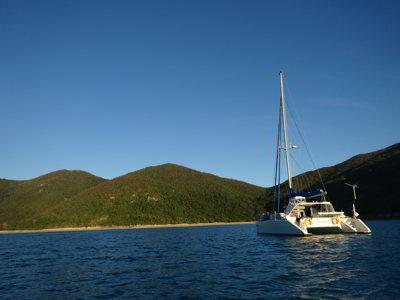 This is an excellent anchorage, capable of holding more than 50 boats. We pull in the screecher halfway along Hunt Channel and then motor the rest of the way. 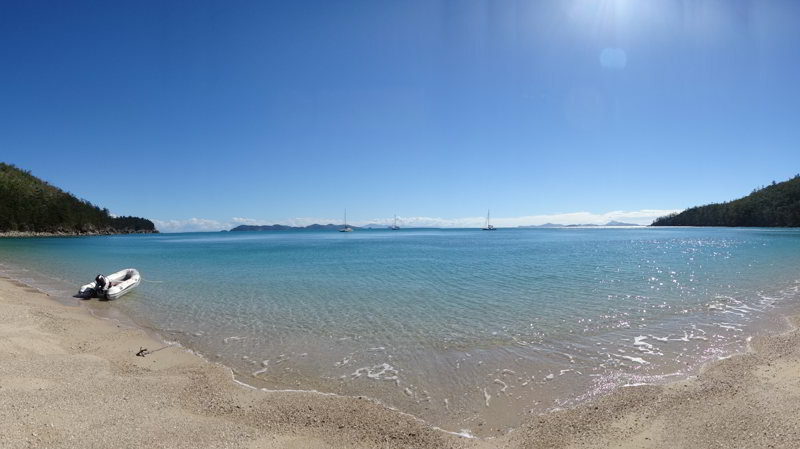 We anchor at 1550 off Sawmill Beach, very close to where we stayed a few times in 2015. We have a cup of tea and then all go to the beach for a short walk. We are back on the boat at 1715. Michael and Kelly have showers and we have sundowners on the back deck. Michael cooks some excellent Aldi scotch fillet steak which we have with fried rice and salad. Michael reads last Saturday’s Sydney Morning Herald which Rosemary brought up with her. We go to bed at 2200. It was a very calm night, though there were some 20 plus knot gusts at times. We wake at 0700 and get up at 0800. 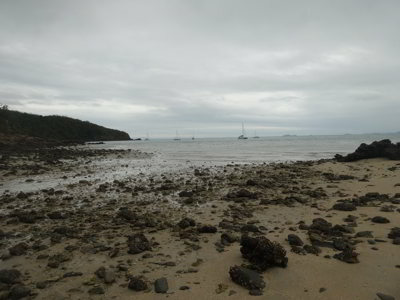 After breakfast Graham, Rosemary and Michael go to the beach and walk the short distance to Dugong Beach. 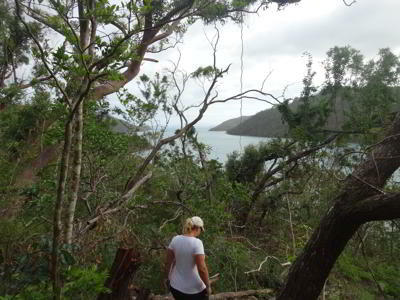 As they walk the track, the devastation caused by Cyclone Debbie back in late March is amazing. 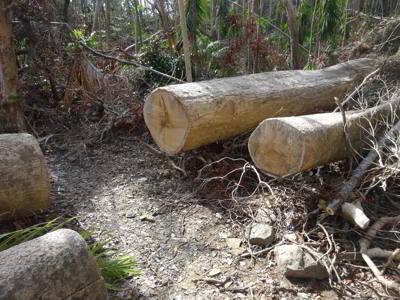 There are huge hoop pines and white cheesewood trees blown over as well as some with all the branches and leaves missing. The palm grove has been stripped of all its leaves. However, the vegetation that is standing is recovering already. The trees stripped of leaves have sprouted new leaves, some coming straight out of the tree trunk, a bit like after a bushfire. 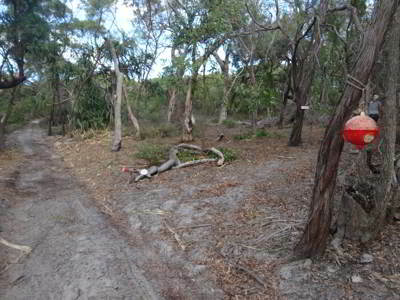 We walk to the beach and look at the camping area before returning to Sawmill Beach. On the way Michael sees a largish goanna. We ready the boat for a departure and at 0950 we leave. We motor out and pull out the genoa as we think it may be too windy. 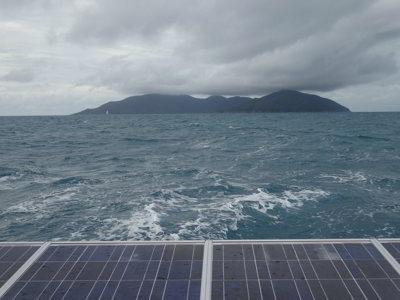 We sail at 4.2 to 5.0 knots in 18 to 25 knots into a slight current. A bit further on we swap to the screecher and do 5.5 knots. 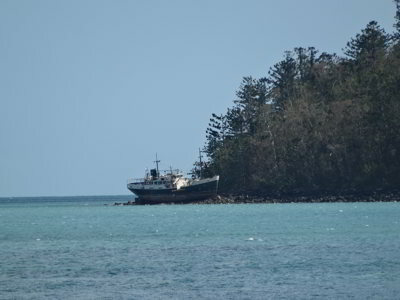 Just to the north of Cid Harbour there is a very large trawler wrecked up on the rocks, obviously from the cyclone. 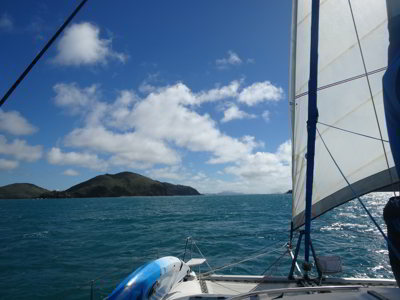 We pull in the sail as we approach the entrance to Nara Inlet and motor right to the end. There is a bit of swell coming in, even right at the end. 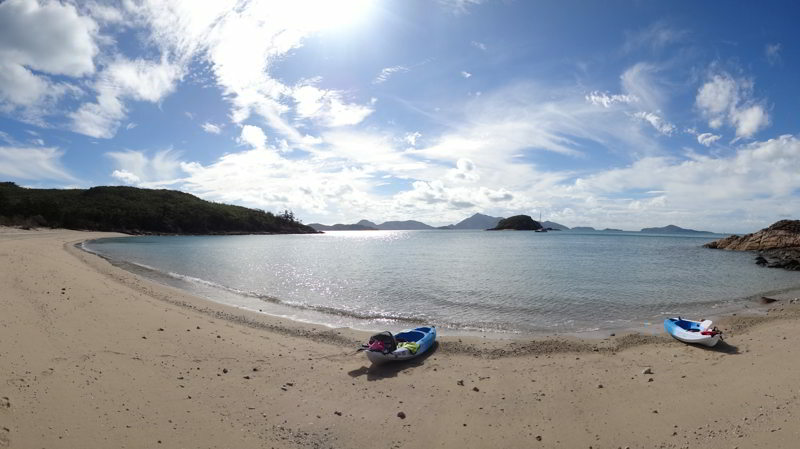 We settle on a spot in the small bay just back from the end, near where we stopped last time. This is a bit more protected. We are anchored by 1400 in 4.7 metres right at low tide. We have lunch and then Michael adds 22 litres to the fuel tank. We also fix the screecher which again slipped a little. As we came in the main inlet we saw a yacht on the sand at the very end of Refuge Bay. However, we assume it is simply careened (wrong as you will see later). At the end of the main inlet there is a smaller boat wrecked on the rocks. At 1530 we motor in Thunderbird 2 to the Aboriginal site. 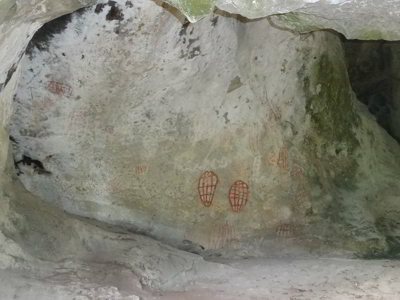 It is a short walk up from the beach to the cave where there is an excellent interpretative display. In the cave there are paintings. 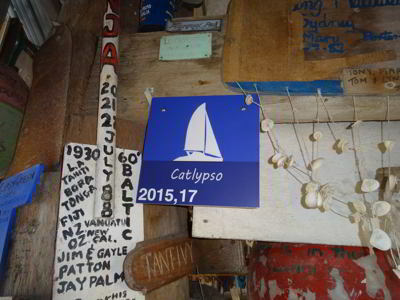 We are back on Catlypso by 1635. We have showers and then sundowners. Dinner is salmon for everyone but Michael (pork chop) with salad. We go to bed at 2100. It was relatively calm last night, some rolling and strong 20 knot plus winds at times. Michael slept right through to 0300 and then mostly through to the morning which means it must have been okay! However, Kelly says she did not sleep much from 0300. We wake at 0700 and get up at 0800. We have breakfast and then head off at 0950. We motor out, needing both engines due to the strong southerly wind (31 knots at times) and the incoming tide. Once outside and around the south-western point of Hook Island, we pull out the genoa and sail at 4.5 knots. As we pass Stonehaven, we increase to 6 to 8 knots as the wind is more on the beam here. The wind varies from 17 to 30 knots. We pull in the sail in The Narrows (between Hook and Hayman Islands) as the wind is likely to go on the nose anytime in this spot. We motor the rest of the way to Butterfly Bay. There are nine moorings here and you are not permitted to anchor due to the coral bottom. There are five free moorings, so we pick up the western most one which we used many times in 2015. We are moored by 1220. All the moorings are taken by 1330 but we are pretty sure one will be vacant as a day tripper boat is on it. Sure enough it later leaves. It is very windy, with gusts over 30 knots at times. We decide we will stay on board and not go snorkelling or around to the eastern bay to see the butterflies. At 1620 we go to the beach, there is a lot of sand missing from the ends of the beach and it seems shallower in front of it. We have showers, sundowners and then Kelly cooks us a lasagne. Yum! We then have pancakes with fruit and ice cream. We listen to the second State of Origin rugby league match via the HF radio. NSW leads nearly the whole game but is beaten in the last few minutes by Queensland. Bugger, just when we thought we might finally win a series. We go to bed at 2200. Click here for next part of this trip. 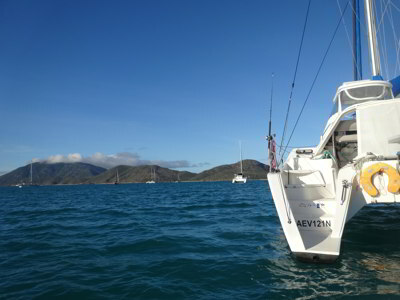 Click here to return to Our Yachting Adventures.